The Vancouver Condo Buzz » PREVIEWS STARTING at Forty Nine West Vancouver Oakridge Condos on the West Side close to the Canada Line SkyTrain! « From Mid $300’s > New Coquitlam REEF Townhomes at Burke Mountain! Two to Four Bedroom REEF Coquitlam Townhouses Perfectly Positioned Between 2 Creeks! Situated on Cambie at 49th Vancouver Westside real estate district, Forty Nine West Vancouver condos is a concrete property featuring residences that are modern, substantial and unique. Some of the features of the Westside Vancouver Forty Nine West Oakridge condos include timeless finishes, nine foot ceiling heights, air conditioned suites and beautiful Vancouver views in every direction. Some of the great qualities that surrounds the Forty Nine West condos include Oakridge Shopping Mall, the Canada SkyTrain Line, stunning Tisdall Park, Langara College and YMCA which are all within five minutes of your new luxury home. There will be a fine selection of 1, 2 and 3 bedroom floor plans to choose from and pre-registration is starting online at www.fortyninewest.com right now! The grand opening is coming Saturday, September 21, 2013! The Presentation Centre is located at 551 West 57th Avenue Vancouver so don’t miss out! If you are looking to purchase a brand new Vancouver Westside condo in the Oakridge neighbourhood, now is the time to be looking! Forty Nine West boutique condos feature 1, 2 and 3 bedroom floor plans and is Vancouver Westside real estate’s best offering this year! Just steps away from the Canada SkyTrain Line, Oakridge Centre entertainment, shopping and dining and the top Greater Vancouver schools, Forty Nine West Vancouver will also be a concrete building with air conditioning, 9 foot ceiling heights and high end finishes throughout. There are also amazing views in all directions. This exclusive Westside Vancouver real estate location is in the heart of the emerging Cambie Corridor which is central to everything. The deposit is 20% total with $20,000 bank draft on contract acceptance, and then a top up to 10% on the seventh day after contracting and the final 10% due upon delivery of the Amendment to Disclosure Statement. Forty Nine West Vancouver Westside condos are brought to you by Wanson Developers. The architects are gBL Architects and the general contractor is VanMar Constructors. The interior design is by Cristina Oberti Interior Design Inc and the project site address is at 6383 Cambie Street Vancouver. The presentation centre (off site) is located at 551 West 57th Avenue Vancouver and there are only 60 homes for sale with both condos and townhouses available. The ground floor will have retail space. The boutique concrete building at Vancouver Forty Nine West will be 8 stories and the estimated completion is for Fall 2015. These prices are subject to change and do not include GST. This is also not an offering for sale. The majority of larger 1 bedroom suites will have 1 parking stall while 2 bedrooms will have 1 parking stall included. All 3 bedroom Vancouver 49 West condos will have 2 parking stalls included. 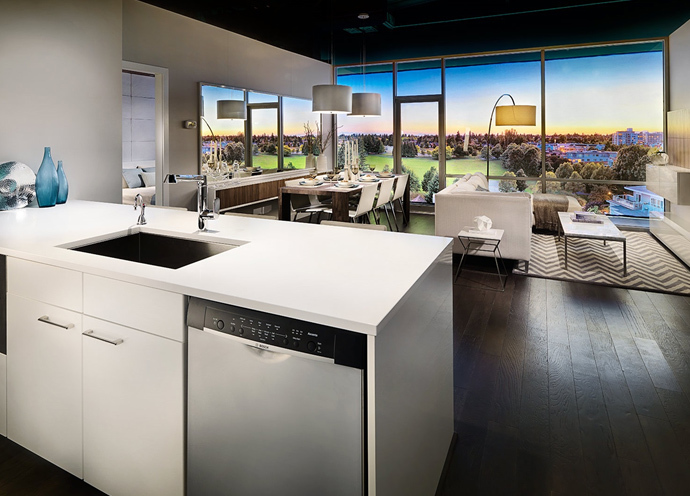 The Westside Vancouver Forty Nine West condos will have Bosch, Blomberg and Fisher & Paykel appliances for all 2 and 3 bedroom homes in addition to concrete construction, air conditioning, 9’ ceiling heights and engineered hardwood flooring. The building itself will have a multi-purpose room, landscaped courtyard, bike lockers and storage lockers. The new Oakridge Vancouver Westside Condos at Forty Nine West are starting previews on September 21st, 2013 between 2-5pm. The presentation centre is on site at 551 West 57th Avenue Vancouver and parking is anywhere along Cambie Street near 57th. Be one of the first to tour the amazing fully finished 2 bedroom display suite at Forty Nine West Oakridge Vancouver condos for sale. The stylish homes with stunning views include 1, 2 and even 3 bedroom floor plans located at Cambie & 49th, just steps away from the Canada SkyTrain Line and Oakridge shopping and amenities. The transit oriented community is also very close to Richmond/YVR as well as downtown Vancouver. The preview event will also showcase a special sales incentive that will be announced on site. The presale price point of these Vancouver Forty Nine West Oakridge condos starts from the mid $300,000’s which is excellent for the Westside. Some of the homes will feature spectacular park views and the building will be of concrete construction. Inside, home owners can enjoy air conditioning as well as nine foot ceilings. The first release of these new Vancouver FortyNineWest Oakridge condos is coming Saturday, September 21, 2013. Get in early and don’t miss out on this amazing opportunity!